Timbit (proper noun): a bite-sized doughnut hole sold at Tim Hortons in Canada. Introduced in April 1976 these treats are now available in various flavours that differ from store to store. Flavours include chocolate, jelly-filled, “dutchie”, honey dip, sour cream glazed, and apple fritter. Sour cream glazed is my favourite. But now that we’re going more gluten-free/paleo/primal, we’re trying to limit the amount of (wheat) grain products we have in our diet! So a while back I had this brilliant idea to try frying my coconut flour muffin batter in coconut oil. “Would that make a timbit?” I wondered. So today I tried it. Yummy awesomeness!! Throw the coconut flour, eggs, vanilla, stevia and butter together in a bowl. Mix well with hand-held mixer. Heat coconut oil (one (1) inch in the bottom of a stainless steel pot) on low to medium heat. Roll dough into one (1) inch balls. Drop one at a time into hot oil. Fry until dark brown but not burnt. Cool on paper-towel-covered plate. 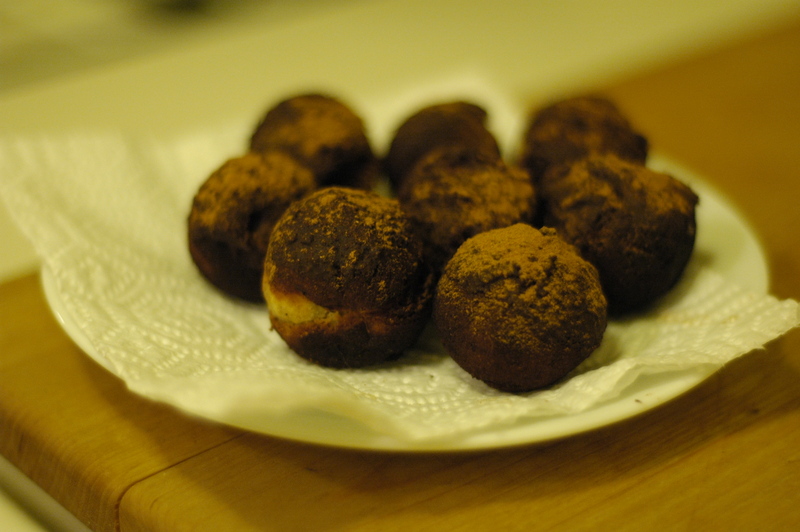 After my timbits were cool, I dipped them in melted chocolate (Ghirardelli) and while they were cooling, I sprinkled cinnamon over them. Heavenly! If you try this recipe, please let me know how it goes!! Previous Post Getting around Injinji! What units are in “1 1/3 coconut flour”? Is that cups, ounces, pounds, kilos, ???? Hi! I don’t have stevia and usually use raw honey as my sweetner. Do you have a suggestion as to how much to use? I was going to make these in the morning! Thanks! Oh yay! Thank you! I am about to start baking any minute. I will report back. Thanks. These went horribly wrong! I don’t know what I did. LOL. They completely fell apart during frying. I was sad. 😦 I ended up making gluten free pumpkin muffins instead. Oh no! Perhaps your coconut flour is a different consistency than mine? That brand of chocolate isn’t gluten free. I would argue that eggs are both paleo and primal. Butter and milk chocolate are definitely “allowed” within a primal food-plan. And if we’re talking paleo, they are both acceptable “cheat” foods.